"There's something about the North," musical Svengali Kim Fowley once said in reference to Detroit's 1950s rock 'n' roll pedigree. Fowley referred not only to the moody intensity of pre-eminent Motor City rocker Jack Scott, but to all of those who followed in his greasy footsteps, from Al Allen to Danny Zella. 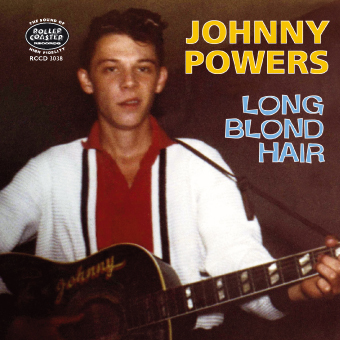 First and foremost was Johnny Powers, the only artist to hold the distinction of recording for both Sun (the tough ballad "With Your Love, With Your Kiss") and Motown (that's Johnny's famous foot-stompin' on the Supremes' "Baby Love"). Racking up experience as a teenage guitarist for Michigan country pioneer Jimmy Williams (and strumming rhythm guitar on Williams' fantastic '55 hillbilly rocker "Teardrops and Memories"), Powers cut his first record, "Honey Let's Go (To A Rock 'n' Roll Show)" in 1957 for another legendary imprint, the infamous Fortune label. As he munched on a Powerhouse candy bar after the session, label owner Devora Brown told him that his born name -- John Pavlik -- just wasn't gonna cut it. "You're Johnny Powers now!" she exclaimed, eying the quickly disappearing candy bar. "Honey Let's Go (To A Rock 'n' Roll Show)," with its plodding back beat, chanting background vocals and incredibly guttural delivery from Powers, perfectly reflected the notorious label's gritty aesthetic, which would soon be etched into history by the likes of R&B geniuses Andre Williams and Nathaniel Mayer. Powers' 1958 session for the local Fox imprint was equally defining. The scene was Detroit's United Sound Systems, a studio that recorded even more hits than Berry Gordy's Hitsville USA, from Jimmy Work's "Makin' Believe" to the majority of the Parliament/ Funkadelic catalog. The able backing, as later noted on the label, was provided by Stan Getz and the Tom Cats. Known for his upright bass thumping in Jack Scott's band, Getz made his mark as lead guitarist with Powers, shredding the strings with unbridled abandon. The results were as torrid as any slice of Dixie-Fried rock 'n' roll ever recorded below the Mason Dixon line. Simply put, "Long Blond Hair, Rose Red Lips" backed with "Rock Rock," was a double-sided killer. And just to prove that lightning struck twice in Detroit that day, Powers' friend and label mate Jimmy Kirkland cut an equally incendiary single, "Come on Baby"/ "I Wonder If You Wonder," with the same band at the same session. Bristling with punk rock energy nearly 20 years before anyone knew what to call it, Powers was on a roll, and his next stop was Sun studio in Memphis, where he was backed by the likes of pianist Charlie Rich, bassist Billy Lee Riley and drummer James Van Eaton for the aforementioned "With Your Love, With Your Kiss." In 1993 Norton Records compiled a highly recommended collection of Powers classics, unleashing previously unreleased gems like "Mean Mistreater" for the first time ever. A single with Norton house band the A-Bones, "Mama Rock"/"New Spark"--as well as a brand new album on Schoolkids' Records--once again solidified his place as a first tier rocker of the highest order.